Carla Cioffi's Qatar series integrates street photography and architecture for a reportage on the transformations taking place in Qatar in preparation for the 2022 FIFA World Cup. Carla Cioffi's Qatar series integrates street photography and architecture for a reportage on the transformations taking place in Qatar in preparation for the 2022 FIFA World Cup. After winning its world cup bid, the whole country has been turned into a huge construction site, with its capital, Doha, smack in the centre. These photos immediately show the all-pervading presence of a so-called construction landscape, which has developed its own language, its own distinctive character. The construction site partitioning, beyond which change is taking its course, is now firmly established in this landscape. 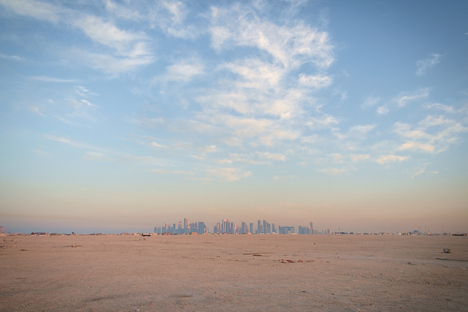 The imposing shapes of mountains of earth and sand virtually become landmarks that dot the outskirts of Doha and then disappear in a few months, paving the way for new roads. As a result, the urban space becomes a continuous flow of materials and people. Materials that transform into cities, people that create new cityscapes. But Qatar is more than just bricks, skyscrapers and moving cranes. Beneath this frenzied surface you can still get a glimpse of the city's past in some places. After crossing the threshold of the transforming sites, Cioffi leads us into the parallel universe of downtown Doha, or what remains of it after the major redevelopment projects in progress. It is here, along narrow lanes, improvised pathways and small mosques, that you can feel the effect of these great changes. In the still intact spaces of the old district of Msheireb, the architectural style retains its human scale, transformed over time by the needs of its many inhabitants. Here the landmarks are not made of steel and glass, their shapes do not defy the laws of engineering, rather they are the places of everyday life, like a small doorway to a courtyard, or the minaret of the neighbourhood mosque in the distance. By crossing the country with a spirit of adventure, photographer Carla Cioffi was able to produce a photographic documentary in progress, just like the object of her photographs. In the course of time they will not testify to a mere before and after, but to the memorable urban transformation that led Qatar to the 2022 Football World Cup. .